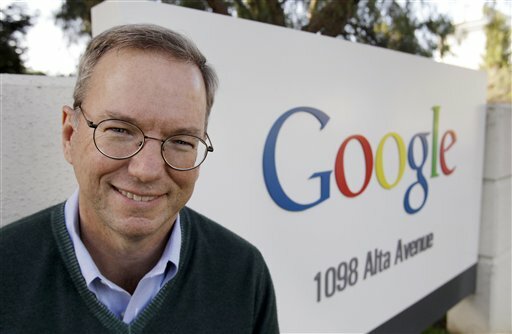 SAN FRANCISCO (AP) — Eric Schmidt, a technology veteran brought in as Google (News - Alert) Inc.'s "adult supervision" a decade ago, is relinquishing the CEO job to Larry Page, one of the prodigies who co–founded the company behind the Internet's dominant gateway. The surprise shake–up announced Thursday appears to be driven by Schmidt's desire to tackle other challenges as much as Page's personal ambition. "Day–to–day adult supervision no longer needed!" Schmidt wrote on his Twitter account moments after Google dropped the bombshell that upstaged its fourth–quarter earnings. Schmidt, 55, will become executive chairman and remain available to advise Page, 37, and Google's other 37–year–old founder, Sergey Brin. Under the new pecking order effective April 4, Page will reclaim the CEO job that he held for three years before the two venture capitalist firms backing Google in its early days insisted that a more mature leader be brought aboard. That led to the 2001 hiring of Schmidt, a professorial engineer who was previously chief technology officer at Sun Microsystems (News - Alert) Inc. and CEO of Novell Inc., both much bigger than Google at the time. After initially resisting Google's overtures, Schmidt bonded with Page and Brin to form a brain trust that proceeded to build the Internet's most powerful company. Google now boasts a market value of more than $200 billion, a success story that has placed Page, Brin and Schmidt among the world's wealthiest people. 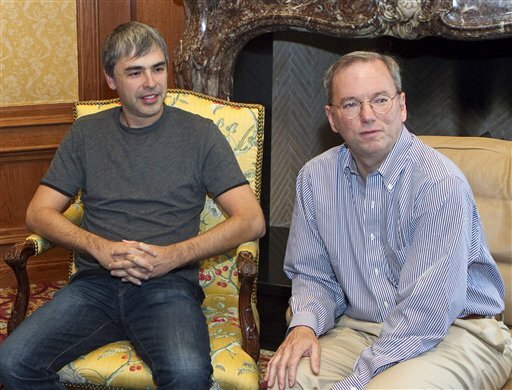 The three men are Google's largest individual shareholders, stakes that turned them all into multibillionaires. But as Google has grown into a company with more than 24,000 employees, its decision–making increasingly has bogged down into a bureaucracy. The managerial constipation and joint decision–making by the trio threatened to put Google at a competitive disadvantage as younger, more nimble Internet services such as Facebook pounce on new trends to lure away users and advertisers. At Facebook, 26–year–old founder and CEO Mark Zuckerberg (News - Alert) calls the shots in an entrepreneurial culture that has enticed dozens of engineers to leave Google to work for the social networking company. "My goal is to run Google at the pace and with the soul and passion of a startup," Page said in a Thursday interview. "I think I will have time to do that given the way we have split up our responsibilities." Schmidt concurred in the same interview, saying Google's triumvirate decided they needed to find ways for the company to run more crisply. "I am not as concerned about the titles as I am winning," Schmidt said. "I am quite certain that this change will result in faster decision making and better value for the shareholders." Google's stockholders have had little to complain about, not that it would have made a major difference because Schmidt, Page and Brin combined own a controlling stake in the company. Google is coming off a year in which its earnings climbed 30 percent to $8.5 billion and, although its stock price remains below its all–time high reached in 2007, it has more than doubled from its lows during the recession. Google shares rose $8.23, or 1.3 percent, to $635 in extended trading after Thursday's announcement. In the regular session earlier, the stock fell $4.98, or 0.8 percent, to close at $626.77. The stock peaked at $747 before the recession. "Eric Schmidt (News - Alert) has played his innings very well," said analyst Sandeep Aggarwal of Caris & Co. The management reshuffling appears to be amicable. Both Page and Schmidt had high praise for each other during a Thursday conference call with analysts, with Schmidt describing Google's co–founders as his "best friends." "I believe Larry is ready" to be CEO, Schmidt said during the call. "It's time for him to have a shot at running this." Page hailed Schmidt as a "tremendous leader" whose contributions exceeded all expectations. "There is really no one else in the universe that could have accomplished what Eric has done," Page said. Although he tried to debunk the idea in Thursday's interview, Schmidt may have been growing weary of all the attention and prosaic duties that come with running one of world's most scrutinized companies. "I don't think Eric was pushed. I think he jumped," said Ken Auletta, author of "Googled: The End of the World As We Know It." ''I think Eric is burned out." There have been signs Schmidt would prefer doing something else. For the first time last year, he started to sit out of Google's quarterly calls to discuss its earnings. More recently, he has expressed irritation about how some of his public remarks have been picked apart to support the idea that Google is an arrogant company that can't be trusted to protect people's privacy as its search engine and other services collect vast amounts of personal information. In October, Schmidt drew fire for responding to a hypothetical question posed at a forum in Washington, D.C., about an implant that would let Google know what its users were thinking. He responded that Google's policy is to "get right up to the creepy line and not cross it," and an implant would cross the line. He also said that as users voluntarily share information online, it doesn't need users to type in search queries for the company to tailor the results. "We don't need you to type at all. We know where you are. We know where you've been. We can more or less know what you're thinking about," he said. 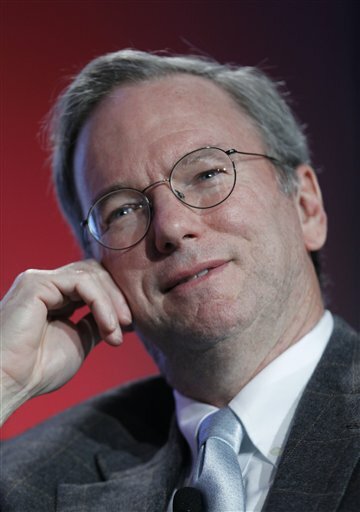 Such comments have been repeated in online musings that portrayed Schmidt and Google as "creepy." "The biggest thing I wonder is after a year or so of having various gaffes and statements taken out of context if he decided he no longer wanted to play that front–man role," said Danny Sullivan, the editor–in–chief of the SearchEngineLand news site. In his new role, Schmidt indicated he will focus on meeting with Google's business partners and government officials around the world. Wrangling with regulators is becoming a more common occurrence as Google tries to expand its empire even as it faces complaints that it has been abusing its dominance of Internet search to thwart competition. Schmidt, who has been called upon to give economic advice to President Barack Obama before and after he was elected, could be well suited to defuse the concerns in the U.S. He is also expected to play a key role in identifying Google's takeover targets, which makes sense if he is also going to be addressing antitrust concerns. The change in command seemed long overdue to longtime Silicon Valley analyst Rob Enderle. "Whenever you have a caretaker CEO, they're supposed to stay in place until the founders have enough experience," he said. "Larry had enough experience about four years ago." Although he is more outgoing than Page, Brin has never shown any interest in being CEO. Now, he intends to concentrate on a few high–priority products. Some are believed to be social tools designed to counter Facebook's popularity, but Brin wouldn't discuss specifics in a Thursday interviews. "I have a passion for several projects," he said. "I don't think anyone has heard of any of them and I don't think anyone will for a while." As CEO, Page will lead product development and technology strategy and run day–to–day operations. Schmidt, Page and Brin all still plan to remain with Google through at least 2024, reaffirming a promise they made to each other when the company went public in 2004. The changes at Google come on the same day that Hewlett–Packard Co. announced its own shake–up, replacing four board directors with five new ones as HP's new leadership tries to dampen shareholder anger over the handling of CEO Mark Hurd's ouster in August. Facebook and other up–and–coming Internet companies still have a long way to go to catch Google, as demonstrated by the way Google cranked up its Internet marketing machine during the holiday shopping season. 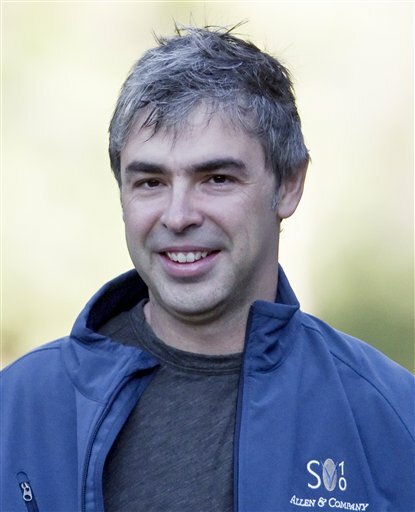 Google earned $2.5 billion, or $7.81 per share, during the final three months of 2010. That's a 29 percent increase from net income of $2 billion, or $6.13 per share, in the prior year. Excluding stock–compensation expenses, Google says it earned $8.75 per share. That figure topped the average analyst estimate of $8.06 per share, according to FactSet (News - Alert). Revenue climbed 26 percent from the prior year to $8.44 billion, from $6.67 billion. After subtracting the commissions paid to Google's advertising partners, the company's revenue totaled $6.37 billion — about $300 million more than analysts anticipated. Google has plenty of ammunition left to finance its ambitions for this year and beyond. It ended December with $35 billion in cash. AP Business Writer Ryan Nakashima in Los Angeles and AP Technology Writer Jessica Mintz contributed to this story.